The winding portion of Route 97 known as the Hawk’s Nest is famous for both its serpentine shape and its breathtaking views. 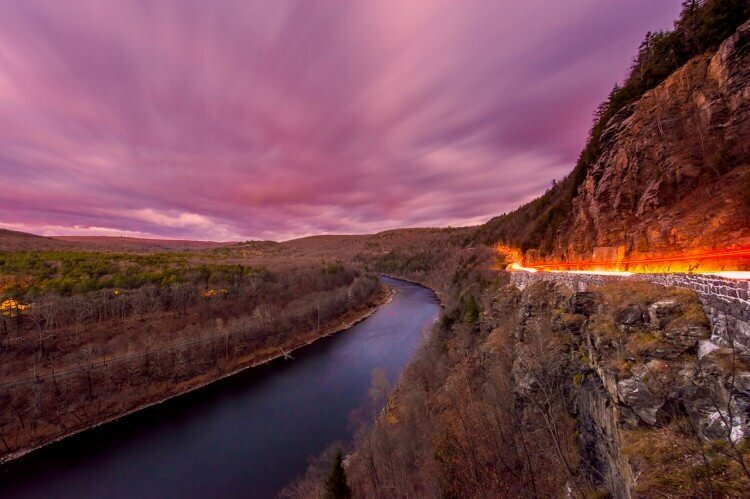 Located just outside Port Jervis, New York, the Hawk’s Nest runs along the side of winding bluffs overlooking the Delaware River. Don’t be surprised if you get a case of déjà vu while driving along this twisting road—it’s a favorite setting for car commercials. While best known as a prime leaf-peeping destination, the Kancamagus Highway has plenty to offer even after the fall foliage is gone. This 35-mile section of Route 112 features awe-inspiring views of the White Mountains, Sabbaday Falls, and Rocky Gorge. Don’t be surprised if your ears pop on this ride. The road ascends 2,680 feet at its highest point. Running along the crest of the Blue Ridge Mountains, the 105-mile long Skyline Drive encompasses all of the natural beauty Shenandoah National Park has to offer. With 75 different lookout points, there are more than enough opportunities to stretch your legs and take in the scenic views of both the Shenandoah Valley and the rolling hills of the Virginia Piedmont. Taking almost 40 years to build and at a cost of $100 million dollars, the Cherohola Skyway is the most expensive highway ever built in North Carolina, Luckily, all of the effort was worth it. Passing through the Cherokee National Forest in Tennessee and the Natahala National Forest in North Carolina, the Cherohala Skyway rises to an elevation of 5,390 feet, providing stunning views of the Appalachian Mountains and the Tellico River Valley. Although only 7.5 miles long, the famous Red Rock Scenic Byway features a range of stunning vistas, from the famous towering red rocks to the pine trees and cacti of the Coconino National Forest. If you’re looking to stretch your legs, there’s a wide variety of beautiful hiking and biking paths located along the Byway. Be sure to keep an eye out for Cathedral Rock. This striking rock formation is one of the most photographed sites in Arizona. Combining New Mexico historical sites with stunning vistas, the High Road to Taos is a must-visit for all road-trip enthusiasts. The 56-mile road runs from Santa Fe to Taos through the foothills of the Sangre de Cristo Mountains. Along the scenic byway travelers can take in everything from stark desert landscapes, lush alpine forests and ancient Indian pueblos. Located along the north shore of Lake Superior, Minnesota’s Highway 61 not only features scenic views of the largest Great Lake, it also passes through seven different state parks. While the fall colors may be gone by November, Thanksgiving travelers can still take advantage of the areas multiple waterfalls and famous lighthouses. This 7.4 mile loop located in Northwest Michigan in the picturesque Sleeping Bear Dunes National Lakeshore. The picturesque drive features views from the sand bluffs overlooking Lake Michigan, a trip through a beech-maple forest and a quaint covered bridge. This gorgeous ocean-side highway is famous for a reason. Even for those who have traveled this stretch many times, the dramatic views of the rugged cliffs meeting the Pacific Ocean never fails to impress. While there are no bad choices when choosing where to road trip along PCH, the famous lone Cyprus tree off the rocky coast of Pebble Beach is a must-see. Built along the cliffs of Chuckanut Mountain, this curving road overlooks Puget Sound. Along the road, travelers can catch beautiful views of the Samish Bay and the San Juan Islands. While natural beauty abounds on this I-5 detour, there are also several high-end eateries located just off of it.